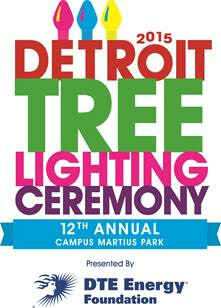 Campus Martius Park will fill with holiday magic and merriment as DTE Energy Foundation presents its annual gift to the City of Detroit -- a beautiful, 60-foot-tall Michigan-grown Norway Spruce decorated with over 19,000 twinkling energy-efficient, multi-colored LED lights and shiny ornaments. The 12th annual Detroit Tree Lighting Ceremony will begin at 5 p.m. on Friday, November 20, 2015. The legendary Four Tops, who helped establish the Motown sound in the 1960s, will headline the festivities, along with former World Champion and Olympic skating legend Todd Eldredge. This year’s program is unique, as all the performers have Detroit roots, including musical entertainment from Detroit favorite Karen Newman, the nationally recognized chorale United Voices of Detroit, Michigan Opera Theatre’s Holiday Ensemble and Children’s Choir, Larry Lee & The Back In The Day Band, and a very special musical performance from Emily Sobeck, a Make-A-Wish Michigan Wish Kid. Joining Eldredge, who trained and performed with the Detroit Skate Club, Detroit’s great skating legacy will also be celebrated with current and future national and world stars performing on the Campus Martius Rink, including the Dearborn Figure Skating Club’s nationally recognized synchronized skating team, the Crystallettes, and other skaters from the Detroit Skate Club, the Arctic Figure Skating Club and the Creative Edge Ice Theatre. Detroit’s largest and most recognized Christmas Tree sits on top of the beautiful Woodward Fountain and will be lit near the end of the show just before 8:00 p.m. The Rink Opening Party, with 95.5 FM, runs from 8:30 p.m. - midnight. The spectacular Detroit Tree Lighting is an entire evening of activities and one of the great family traditions enjoyed by thousands of Detroiters. The Salvation Army will light its giant Red Kettle at 6:00 p.m. Other family activities for the evening include The Rink Opening Party, Showcase D’ Holidays with food, drink and music, The Salvation Army Family Fun Tent, photos with Santa, and horse-drawn carriage rides. 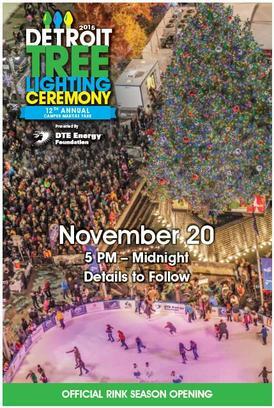 The November 20 Detroit Tree Lighting Ceremony, presented by DTE Energy Foundation, officially kicks off Detroit’s Holiday Season, which includes public skating at the Rink and Quicken Loans Season of Winter Magic.